For more than a quarter of a century, a federal agency in the Pacific Northwest has been running the world's most expensive wildlife restoration program, designed to save 13 species of endangered salmon and steelhead. The Bonneville Power Administration, responding to concern about dwindling fish populations, has spent more than $8 billion helping salmon travel from the mountain streams of their birth to the Pacific Ocean and back again, where they lay eggs for the next generation. Impeding their journey are several hydroelectric dams. The agency has little to show for its efforts. In any given year, only 1% to 3.5% of the fish complete the 1,800-mile round-trip fish trek, which begins 20 miles northeast of Lewiston, Idaho, and continues down the Snake and Columbia rivers. Fish scientists say the success rate should be at least double that. With the help of elaborate handling and tracking equipment, Bonneville is beginning to figure out what has gone wrong. Previously overlooked dangers abound. Some of the perils, including federally protected birds and sea lions -- as well as Canadian fishermen -- are beyond the agency's control. Others, it turns out, include Bonneville's own efforts. In one well-intended move, the agency transports some salmon around the dams on special barges. After being deposited clear of the whirring turbines, the disoriented fish are easy pickings for predators. The outlook remains gloomy next year, says Michael Ford, who directs the conservation biology division at the National Oceanic and Atmospheric Administration's fishery science center in Seattle. Because of shifting currents, he says, the ocean is expected to be warmer, which is worse for the fish; warm waters carry less food. "We can't be confident that these populations are viable in the long term," he says. The population of salmon and other fish has been declining here for more than a hundred years, caused initially by overfishing in the early 20th century. Critics say the dams accelerated the trend. The annual catch of salmon and steelhead in the Columbia River has dropped to less than five million today from a high of 50 million pounds in 1911. Meanwhile, this year's count of salmon running through the dams is below the 10-year average. Congress established the Bonneville Power Administration in 1937 as a self-financing agency to provide power to the region. It supplies about 40% of the electricity in the Pacific Northwest through 31 hydroelectric dams, including eight on the Columbia and Snake rivers built from the 1930s through 1970. In 1980, federal lawmakers, worried about the decline of the salmon, ordered Bonneville to "protect, mitigate, and enhance fish and wildlife" affected by the dams. Bonneville spends so much to that end that it is affectionately called "Aunt Bonnie" by the small army of scientists and others working to save the salmon. The effort includes four states, four federal agencies, the Bush Administration, Canada, several federal judges and an assortment of Indian tribes. Most of the salmon spawned in Idaho, Montana, eastern Washington and Oregon navigate Bonneville's dams twice during their lives. Their first journey takes them downstream to the Pacific, where they spend one to three years growing into adults. Then they return, leaping up steps built next to the dams known as fish ladders, a stream of water flowing over stairs that somewhat mimic the unencumbered rapids their ancestors knew. Once home, they lay and fertilize their eggs. To further help the fish, Bonneville this year will spend almost $700 million. That includes the cost of spilling water over dams to create a cooler, more rapid-flowing stream, which is supposed to help salmon reach the sea. The water otherwise would be used to produce $356 million of electricity. Other fish-friendly improvements include special chutes for young fish and electronic transponders to track their journey. "There are light years of difference between the way the fish were handled in the 1970s and the way they are now," says John W. Ferguson, a top fish biologist for the National Oceanic and Atmospheric Administration. The price tag -- which adds 30% to the electric bills of some Northwest consumers -- upsets lawmakers on both sides of the aisle. They are pushing legislation to require the power authority to list the cost separately on electric bills. In a recent survey, consumers said they thought the fish-saving effort added 5%, at most, to their tabs. "Lately this has been used as a kind of unlimited fund," fumes Republican Sen. Larry Craig of Idaho. "If I had to go before Congress every year to get $700 million to provide for habitat and other improvements for salmon, I wouldn't get anywhere near that amount of money." Stephen J. Wright, Bonneville's administrator, says the new accounting proposal "makes sense," but adds that he would prefer to show the cost as a percentage of Bonneville's $3 billion annual budget. Bonneville defenders say Congress has complicated efforts to save the salmon. Under the Endangered Species Act, for example, Indian and commercial fishermen are allowed to catch and sell wild salmon scooped up accidentally during the harvesting of hatchery fish. Legal battles between various interest groups dating back decades haven't made matters easier. For many salmon, the first major obstacle on their swim to the Pacific starts at Lower Granite, a 3,200-foot dam jutting across the Snake River about 70 miles south of Spokane. Until the mid-1980s, the baby salmon, four to six inches long, had to survive a churning, pressurized plunge through whirling turbines. An early attempt to provide an alternative sent the fish zooming through fast-moving spillways where they bounced off the cement walls. As many as 10% of the fish were killed at each dam. Today, fish that arrive at the top of this dam are sucked into a "juvenile bypass system," a series of pipes and chutes where the water moves more slowly to minimize bruising. Many are steered into a special fish-handling room, knocked out by a bath of mild anesthetic and injected with tiny transponders about the size of a grain of rice. Bonneville buys two million a year at $2 a piece, enabling scientists to track the salmon's journey. 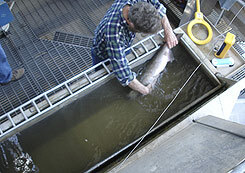 After the transponders are inserted, some fish are gently returned to the river to navigate the other seven dams, which are equipped with similar bypasses. The majority are pumped into the tanks of one of eight specially designed barges that deposit them in the Columbia River estuary beyond the last dam. In the tranquil, 36-hour cruise, 98% of the salmon survive, according to Bonneville. The barges were supposed to be a temporary fix to give the salmon population a chance to recuperate. New data from the transponders show that a quarter of the salmon are dying in the estuary. "That has been an eye-opener," Dr. Ferguson says. Scientists are hotly debating the cause. Some blame an unusual concentration of predatory birds at the mouth of the river, including Caspian terns, which are protected as an endangered species, and double-crested cormorants, which come under another federal law protecting migratory birds. These birds hit the young salmon like feathery dive-bombers and may cause as many as 4% of the estuary deaths, NOAA says. Thousands of transponders are being recovered from piles of bird dung. Ed Bowles, chief of fisheries for the state of Oregon, says Bonneville -- not the birds -- is to blame. He says many of the fish left to navigate the dams alone are too stressed and weakened to survive the rigors of the estuary. The barges, he says, just make things worse. "Collection and handling causes a lot of stress," he says. The barged fish become disoriented and aren't skilled at avoiding predators. Studies suggest they are dying at twice the rate of other fish, Mr. Bowles says. To settle the controversy, NOAA persuaded Bonneville to buy "acoustic tags." The devices, which are inserted into the salmon as they leave the last dam, are larger than the transponders, which can be detected only when the fish swim through narrow tunnels in the dams. The bigger devices give off a distinctive ping that can be picked up by underwater microphones, enabling scientists, for the first time, to track the fish in the estuary via computers. So far, Bonneville has implanted 14,000 tags at a cost of $270 each. When, at a year old, the salmon leave the estuary -- heading into the Pacific Ocean and then north into Canadian waters -- they face other threats. Canada changes the times and locations where fishing is allowed to protect endangered Canadian salmon species during their peak migration periods. That move pushes Canadian fishermen to catch more American salmon, say critics in Congress. According to some U.S. fishing groups, 40% of the Canadian commercial salmon catch consists of U.S. endangered species. Terry Beacham, a research scientist for Fisheries and Oceans Canada, a government agency, admits it is "a possibility" that Canadian fishermen are catching more U.S. salmon, although that is "not the intent of the [fishery] managers." The government's goal, he says, is "to reduce the exploitation of fishing stocks that are of concern in Canada." Salmon remain as long as three years in the ocean, where they mature and take on weight. Some are caught by Japanese and Russian fishing trawlers. Ocean conditions are the single biggest factor that determines whether the fish return to spawn or die at sea, according to NOAA. Food-filled cold currents are good for the fish, warm currents bad. Salmon that make it through Canadian waters and start their trip homeward have to run a gauntlet of new perils. On the return journey, the dams are a less of a concern, since all are equipped with fish ladders. Instead a population of voracious male sea lions waits to ambush the salmon below the first dam. The sea lions tear off and eat the egg sacs of returning females. The fattening fish oil in the eggs makes them more attractive to female sea lions during summer mating season. Commercial fishermen used to shoot the sea lions but that is now banned by the 1972 Marine Mammal Protection Act. As their population increases, some sea lions have learned to climb the fish ladder of the first dam. Crews hired by Bonneville have tried rubber bullets, rubber-tipped arrows, fireworks and special cages. The sea lions, which destroyed 3.4% of the returning spring Chinook last year, have ignored the fireworks and are learning to get through the special cages. Above the Bonneville Dam -- 140 miles into the salmon's return journey -- the human threat looms large. There, Indian tribes and other fishermen are permitted to fish for salmon under not only the Endangered Species Act but also under various treaties and state laws. Indians have had the right to fish for salmon for more than a century in return for turning over their land to the federal government. The result of this legal loophole: The tastiest of the salmon species, the spring Chinook, is served up at Seattle restaurants that pay as much as $26 a pound. Having an endangered-species law that allows people to catch and eat salmon, an endangered species, "seems curiously out of synch," James L. Connaughton, chairman of the White House Council on Environmental Quality, said in a speech this year. Indian salmon hatcheries and fish-preservation programs are financed, in part, by salmon sales. "We must have salmon to save salmon," Billy Frank, the spokesman for 20 fishing tribes, explained to a congressional panel last year. State laws, meanwhile, allow fishermen to take as much as 50% of the returning fish in any given season. That right is defended fiercely by powerful groups, including the Northwest Sportfishing Industry Association, which says it represents business interests such as boat and tackle makers with total annual sales of $3.5 billion. The group would like to see four of the eight Bonneville dams torn down to restore the wild river. It helped persuade a federal judge to order Bonneville to spill more water over the dams to increase water flow. Northwest River Partners, a group that represents local utilities, farm groups and others that use the river for transportation, would rather not spend any more money to help the salmon. They also maintain that water spills don't help. Over the years, head-butting between sportsmen and local businesses has stymied government policy by making a comprehensive solution harder to achieve. There are currently 22 separate cases asking judges to intervene in various parts of the salmon problem. One dates to 1969. At Lower Granite, the salmon face one last man-made diversion before getting to their spawning grounds. A computerized piping system shunts some into a room where they are anesthetized in a bath of sweet-smelling clove oil. There, biologists examine them for marks that tell more about their adventures. Some have "golden arches," crescent-shaped scars on their bellies left by seal teeth. Others have red lines around their gills, showing where they wriggled out of nets that would otherwise have suffocated them. "If they weren't as flexible as they are, these species would have been gone a long time ago," says Dr. Ferguson, the NOAA biologist.